Possible Shark Addition? continued) Wow, thanks Mike for the quick reply.<You're welcome and you got me again> For your question, I did add the fish after the tank had cycled and the tank was cycling for about 6 months until I added the fish to the tank. I realize that when adding the new fish to add them very slowly and not all at one time so the tank can stabilize with the large bioload that it will create.<Very good Grasshopper! **grin**> Though, in a couple more months when the tank is ready for me to add the large angel, I read that the angel should be added last to the aquarium, but should I add the large angel and the 2 dwarf angels at the same time so they wouldn't fight to avoid territorial conflicts or would this be too strenuous on the stability of the aquarium and detrimental to the other inhabitants?<I wouldn't be concerned about the large/dwarf angel problem, although you should make sure there is plenty of LR arranged so that the little ones can escape to areas where they can't be followed. Often large and dwarf species don't seem to recognize each other as even being related. I WOULD make sure to add all dwarf angels simultaneously, though!> Also for future reference, if I did upgrade to a bigger tank again and placed the damsels in my other 55 gallon, would I have to be worried about the angels and stars and stripes puffer who is very peaceful at 7" right now, picking on the shark?<This would be my concern, and in relation to the Angel only, because of territorial aggression, with the puffer likely not a problem in that respect> or would it be the other way around, the shark picking on the puffer and angel?<Only if the shark is starving, and if a shark ever attacks and kills a puffer it's usually fatal to AT LEAST the shark and puffer, occasionally to everything in the tank. Once it's shredded in the aquarium, any fish that so much as samples one tiny piece containing tetrodotoxin is doomed> Thanks again<You're welcome> and sorry for all the questions :-)<Why? No questions=no reason for me to be here. As it was once said (Mark Twain?)" The only dumb question is the one never asked." Wants to buy a lemon shark - 1/23/04 I want to buy a lemon shark. <Amrita, I know I am here to help and so I will do just that. Please do a modicum of research before sending such a question as just entering "lemon shark" into a webpage returns over 300 hits on Lemon Sharks. With that, the first site that comes up relates to me all sorts of information about lemon sharks. Here is the site and an except: http://www.flmnh.ufl.edu/fish/Gallery/Descript/LemonShark/LemonShark.html "Size, Age, and Growth - Lemon sharks are one of the larger species of sharks, commonly obtaining lengths between 95-120 inches (240-300 cm or 8-10 ft.). and have a growth rate of .21 inches/year (.54 cm/year). The maximum length that can be reached by this species is between 125-135 inches (318-343 cm). Females and males reach sexual maturity around 6-7 years of age and at 95 inches (240 cm) and 88 inches (224 cm) respectively. Pups are between 24-26 inches (60-65 cm) at birth." Help us help you.> One source said that they only need a 500-gallon tank but that cannot possibly be humane! <You are correct> Is this information correct? <It is not. The fact that you ask is a cause for concern here.> Also, where can one purchase shark eggs from a reliable source? <I am sure that most of the LFSs and online dealers can or do have various sharks and eggs available to purchase and it wouldn't surprise me that they might have the audacity to sell lemon sharks. 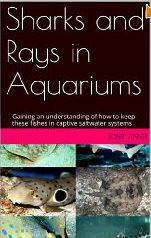 I really recommend against aquarists owning sharks. I just recently removed a Blacktip from a local fish store here in the Bay Area and took it into our stock here at the Monterey Bay Aquarium. This is the third time in the last year we have done this. Sharks grow too quickly and their long term needs are almost never met. Please reconsider this but if you must, do your research my friend. ~Paul> Thanks for any help. 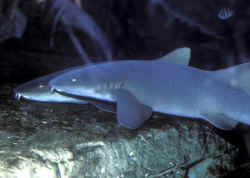 Arabian Bamboo shark? Is there anyone that could direct me to a source for the Arabian Bamboo Shark (Chiloscyllium arabicum/confusum)? I am sure they would make a more suitable captive shark than the common Chiloscyllium punctatum. I have read Scott Michael's book. I can't find a source for them anywhere on the internet. I can find every un-suitable shark but not this small Bamboo. <Although that made me giggle, it is very sad and unfortunate how many un- or misinformed aquarists keep the shark trade going with ridiculous items such as nurse sharks.> They are supposed to be quite abundant during the summer months. I have touched them while at Underwater World in The Mall of America. I would really like to have one. My local fish stores & their suppliers are no help. <Give our sponsor www.themarinecenter.com a holler and tell them we sent you, if anyone can get them, they can. Kudos for being a responsible would-be shark keeper, I bow to you! -Kevin> Thanks Warren F.